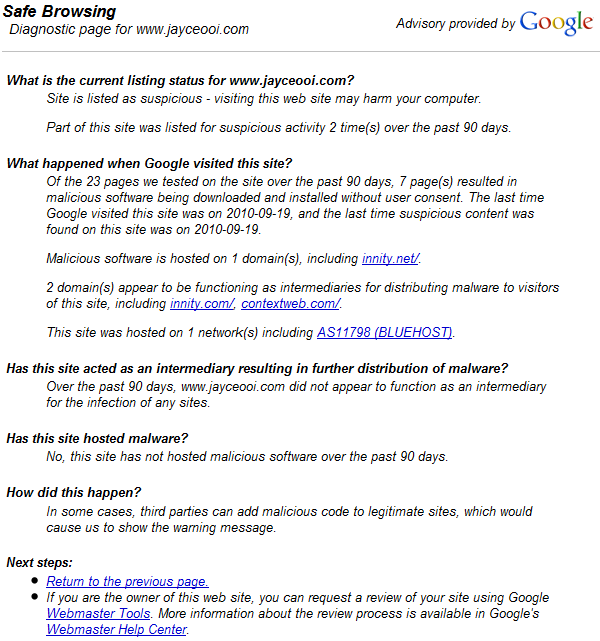 Err… I noticed JayceOoi.com had been marked as “Reported Attack Page!” early this morning. First thing that I can think of ~ which advertising company is causing the issue? I don’t install anything new lately. So it is not from my side. ADSDAQ from ContextWeb is the first one that I blame. It has past malware record due to its client ad codes redirection. But I doubt it is ADSDAQ that causing the problem because my other blog like this one which is Publishing ADSDAQ Ads does not have issue. However, I disabled it anyway before I went to sleep. Wake up and still see the issue. Why? Further discovering… Found out that it is caused by Innity Ads. OpenX Ad Server is widely used by advertising companies. I suspect Innity is using it and did not update to the latest version 2.8.7. The previous version has vulnerability issue and had being compromised. Innity staffs seem to be very busy lately. The July payment is delay again. And has malware technical issue now. Are your blog / website infected by Innity ads? Will you put Innity ads back after the issue is solved?